It’s November 1st which means that Nanowrimo has finally arrived, much to the delight and dread of the thousands of us who’ve entered it (and good luck to all the fellow writers reading this). Instead of prepping like crazy last night, I decided to meet up with a friend (who’s also entering the NaNoWriMo challenge) and we visited the Vintage Market in Woodstock Town Hall. Though many of you may wonder in despair why I decided not to do the writing challenge at the stroke of midnight , I felt it was best to unwind before the need to start writing for several hours a day takes hold in full force. It was a ton of fun, with lots of stall owners in Halloween outfits, beautiful clothing hung, draped and displayed, along with jewelry, shoes, and knickknacks. I ended up getting a small travel-sized jewelry box, which will be perfect for weekends away (I usually use old pill containers to transport my necklaces). Today, after a hearty Benedict eggs and salmon breakfast at Tribakery with my husband and mother in law, along with a heavenly hazelnut latte, I returned home to start writing. How has your first day of NaNoWriMo gone? I also had a leisurely evening – if you can call trick or treating with sugar induced children leisurely! But then my daughter surprised me by cooking breakfast for her and her brother (I was left to fend for myself) and I put in a good chunk of time to come out with a little over 2000 words! 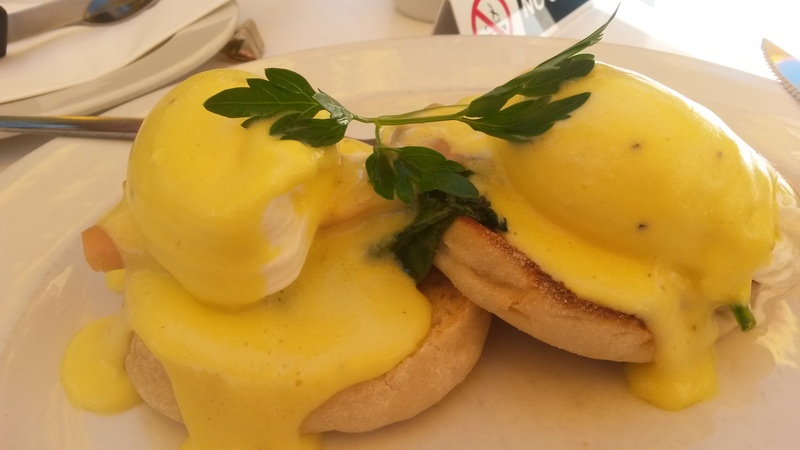 And those Eggs Benedict (my favorite breakfast) look scrumptious!